My friends, family, and colleagues know that I love beer, so I tend to get a lot of beer-related gifts around the holidays. Over the years, I’ve been fortunate enough to receive a variety of beer gifts, such as books about beer, beer drinking glasses, gift certificates to brewpubs, beer t-shirts, and even a beer holster. Without a doubt though, the best beer-related gift is…beer! During the 2011 holiday season, I was given a membership in a beer-of-the-month club: The Great American Beer Club, from Clubs of America. Each month I receive a 12 pack of four different types of craft beer, along with the club newsletter Beer Expeditions. The beers are delivered to my front door via UPS in special packaging to prevent breakage. My January 2012 shipment arrived with two beers from SweetWater Brewing Company (Atlanta, GA) and two beers from Casco Bay Brewing Company (Portland, ME). I was familiar with both of these brewing companies and have enjoyed their beers over the years. I especially love brew from Maine so I was excited to see Casco Bay in the mix. 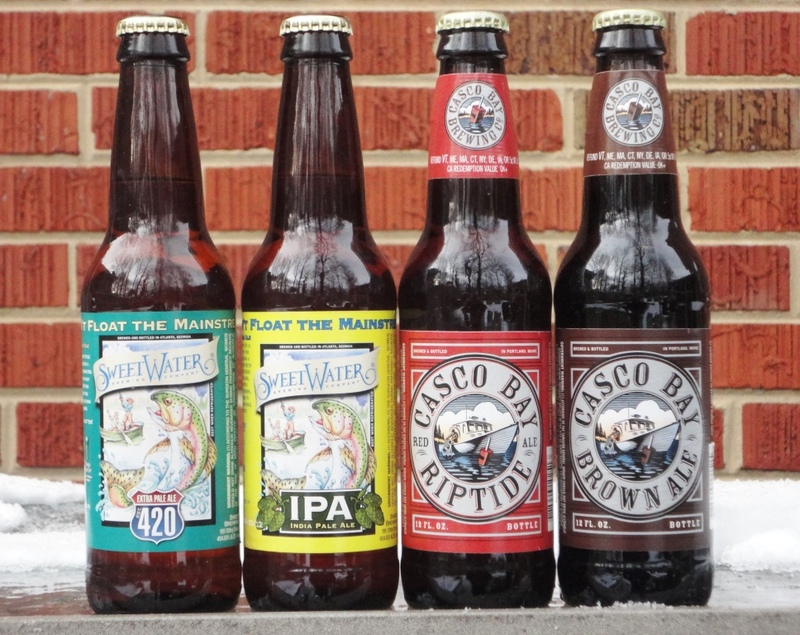 Casco Bay Brewing Company started brewing in 1994 but since 2008, its beer has been brewed by Shipyard Brewing Company. Thanks to Pat for the gift of beer! I can’t wait until my next shipment! Sweet Water IPA is one of my favs. It’s the first craft beer that I ever had and it changed it all for me. The club sounds like a blast. Enjoy!